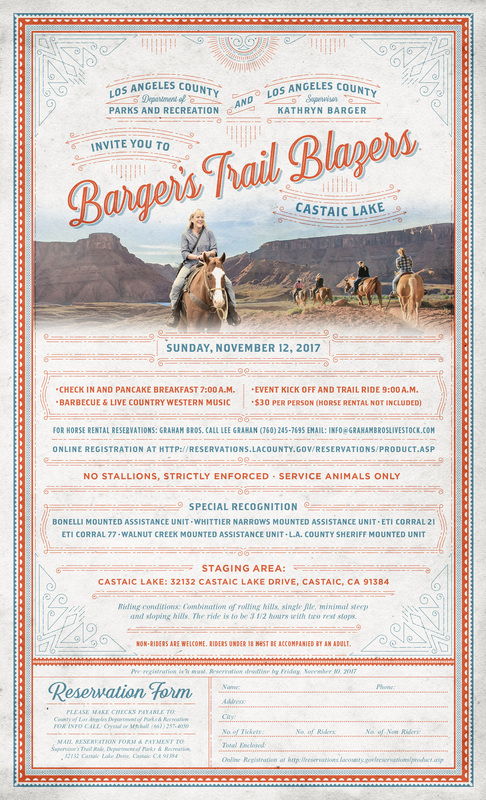 Join us for an exciting and picturesque morning trail ride at Castaic Lake including a pancake breakfast, barbecue and live country western music. Check-in and pancake breakfast is at 7:00 a.m., with the trail ride beginning at 9:00 a.m. and will continue through the Castaic Lake scenic trails. The day will conclude with a traditional barbecue and live country western music. The cost of the trail ride is $30 per person, which includes breakfast, lunch and refreshments during the ride (horse rentals are not included). Non-Riders Welcome. Event Details: Pre-registration a must. Registration deadline is Nov 10th. The riding conditions include a combination of rolling hills, single file, minimal steep and sloping hills and two rest stops. No stallions strictly enforced and service animals only.